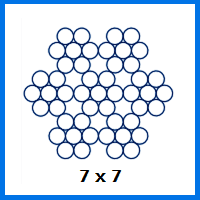 There are a total of seventeen different diameter options when you are browsing our 7×7 stainless steel wire rope range. With a 6mm thickness, this particular 6mm 7×7 stainless steel wire rope is quite a bit sturdier than many of its stable mates, with a load capacity that will make light work of lifting tasks. Safety and reliability is assured thanks to the 21.9kN breaking force that this rope boasts. Its strand configuration and diameter also allow for a WLL of 2,235kg. If you are on the lookout for stainless steel rope which is thin, flexible and still surprisingly strong, this is the product to pick. If you have worked with steel in the past, then you will appreciate that corrosion is a costly complication associated with this material. Stainless steel, on the other hand, is much better protected against rust, allowing this rope to thrive in outdoor conditions. Paired with its polished finish, there are lots of sensible justifications for selecting this 6mm 7×7 wire rope. Often if you are thinking about buying stainless steel wire rope, you will face a conundrum when deciding between the various strand configurations. In short, each option sits at a different part of the spectrum between rigidity and flexibility. 1×19 rope is tougher but less supple, while 7×19 rope has malleability on its side in place of pure strength. 7×7 rope exists between these two extremes. Fill out our online query form or call us on 01384 78004 if you are still stumped when it comes to stainless steel wire rope. Our expert staff can help you navigate any issue. 6mm 7x7 Stainless Steel Wire Rope Overall rating: 5 out of 5 based on 6 reviews.